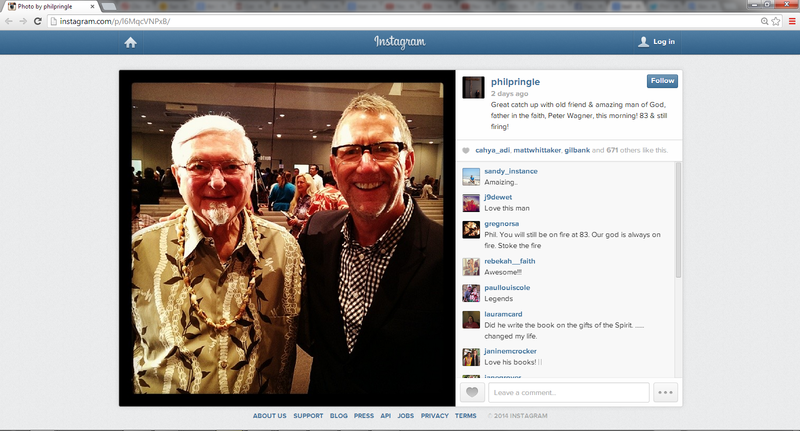 We know Pringle has been influenced by the dangerous teachings of the ‘New Aposolic Reformation’ (NAR) leader, Peter Wagner. This is evident in Pringle’s books. Wagner’s church growth teachings and formula’s on how to spiritually “advance” the church are incredibly dangerous and border on demonic. Wagner, alongside Rick Warren, are some of the most dangerous men in the church today. Many websites have thoroughly examined Wagner, his teachings and his associations with incredibly blasphemous or dangerous men. Thanks to Pringle, he has confirmed to us his close association with Wagner. It’s important to know that Wagner is an old friend of Pringle’s. Great catch up with old friend & amazing man of God, father in the faith, Peter Wagner, this morning! 83 & still firing! California pastors Ché Ahn and Bill Johnson, along with Canadian pastor John Arnott, laid hands on the 32-year-old Bentley while Peter Wagner, leader of the International Coalition of Apostles, read a statement about the need for apostolic alignment. Wagner said to Bentley on the platform: “This commissioning represents a powerful spiritual transaction taking place in the invisible world. With this in mind, I take the apostolic authority that God has given me and I decree to Todd Bentley, your power will increase, your authority will increase, your favor will increase, your influence will increase, your revelation will increase. Source: Leaders Commission Todd Bentley at ‘Lakeland Outpouring’, Charisma, http://www.charismamag.com/cms/news/archives/0624082.php, Published 24/06/2008. From what we understand, false apostles and prophets like Peter Wagner knew of Todd Bentley’s adulteress affair and controversial past and decided to endorse him against their better judgment. Not long after Wagner prophesied over Bentley, Bentley was internationally exposed of having an adulterous affair and also confessed to having drinking problems. The false prophets, teachers and apostles at Lakeland (specifically Rick Joyner and Bill Johnson), went into damage control in an attempt to recover their image. Here is Peter Wagner speakign over Todd Bentley. This is just one of many instances where Wagner has exposed himself as a false apostle, false teacher and false prophet. Once again, Pringle shows he has no discernment or any biblical understanding on the holiness of God. Why does Pringle choose to associate himself with men who do more harm in Christ’s church than good? The trouble with institutional Christianity today is the focus on the trappings of success in church numbers and performing talents whether in music or preaching. Thus popularity becomes the yardstick of success. But true success is not based on human talent and Hollow-wood -style popularity. The Apostle Paul made it clear – he was no dynamic preacher like Billy Graham – he confessed he was not an eloquent preacher; he was no paradigm of sinless perfection – he shared insights into his trials and personal failings and more, yet we respect and love this mighty man of God because of his honesty and transparency. He was upfront and holy and had nothing to hide. He put up no false front. He was a true apostle and holy in private and public life. God knows our ‘secret sins’ and gives us time to repent but if we think we can go on our merry way and live in sin we may face the tragedy of Ananias and Sapphira and be struck dead or be unexpectedly smitten with sickness or be providentially exposed. Jesus denounced the Pharisees for their outward shows of piety and their habit of heaping praise on one another. Today we see Christian leaders create their cartels of power and circulate among themselves and as usual the unwary lambs follow them like sheep without a shepherd because they do not follow the True Shepherd. They show more loyalty to their pop leaders than to Jesus Christ. How do I know? When I see them defending their pop heroes who should be repentant of their sins and crimes and that in disobedience to the Bible’s admonition for us to ‘exposes sins’ in our midst and bring to light what is in darkness. ‘A wicked generation asks for signs and wonders,’ warned Jesus and while God works miracles still today the false apostles cash in on the public’s appetite for faith in signs and wonders and ‘feel good’ religion at the expense of persoal holiness and obedience to the Word of God and above all, Christlike love for others. If success is measured only in numbers and charisma then many cults ate successful. But is God pleased, is God in the midst of celebration among the Golden Cow? I doubt it. 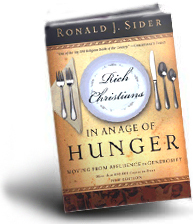 Numbers have a place but through the sieve of holiness, humility and the test of Biblical propriety. Beware of those who play God among you and ascribe to themselves a superior status than what the Bible teaches. “Do not be called Rabbi for one is your Teacher and you are all brothers,” Jesus taught so no one is above or below you. Respect and submit to the authority of your leaders but not blindly and obsequiosly as to a Pope and unless they first submitbto the Word of God and God himself. Beware of those who call themselves ‘Apostle’ for they usurp the title and honour meant for the Twelve but who can deny we may do the work of apostles without calling ourselves by the title. Do we call ourselves ‘Savious’ when we do the work of saving souls? I came to Christ in the Easter of 1973 from a Buddhist background and over the years have seen the rise and fall of many so-called ‘anointed’ persons. There is no such thing as ‘an anointed’ Christian. We are all anointed by God when we receive the Holy Spirit when we were born agains. There are no special and select groups of people who are ‘anointed’ by God in our midst. There are false prophets and teachers though they may preach the Gospel. Just read and understand the Bible and get the gist of what God teaches. So called ‘anointed’ whether self-anointed or anointed by mates people need to be highly regarded because they lack credibility beyond a convincing personality and some ability to persuade. 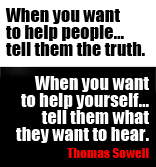 They are straw-men and the test of their spirituality is their humility and transparency. 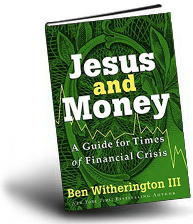 Did Jesus live in million-dollar homes? Wealthy business people who come to Christ may do so but an ‘anointed’ worker of God? Preachers who become rich are a sick joke and the sooner they are exposed for their fraud the better. A church that shelters a dishonest and unrepentant shepherd has become a den for wolves and be sure God is not in it as he is not among the multitudes lost in false religions. The spiritual man makes discernment about many things and nothing saddens me more than a Christian leader on an ego trip abusing his role within the church to elevate himself and not conforming to the Biblical standards we are taught. Worse is the sheep that feeds the wolf in sheep’s clothing. Who will save us from the scourge of the masquerade? I leave room for God/my misjudgment, however pretty much have no time for any of these guys. For Bob Jones and Rick Joyner to “re-endorse” Bentley plus his new wife Jess after he had an affair is disgusting. What has she got to do with his ministry? Is “breaking the curse” and ‘negative words over his life’ just to patch up the affair he had? Who made these guys self-proclaimed Apostles? Who made Peter Wagner an apostle? The rest of the NAR movement? Having only listened to Pirate Radio’s interpretation of “Apostle” has got me thinking, considering there hasn’t been any since John, and now all of a sudden they are making a re-emergence. Maybe God is just raising up “leaders”. Shouldn’t the “apostles” be guiding the church? Please point me to a place in the Epistles where the Apostle and Prophet worked together? (I could be wrong). This is completely off topic, but keeping in line with the apostle thing, I do believe that prophecy exists today. 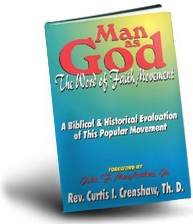 Of course – some genuine, by genuine, humble, respected men and women with a prophetic gift. And there are some incorrect, maybe even false prophets. On the big glitz-and-glam prophets there seems to be a big push on current events, ie getting the US election wrong, getting the Australian election wrong, earthquakes etc. I remember one (from a well-known prophetic ministry) who said, in the midst of Kim Jong Il’s nuclear craziness that “I saw Kim Jong Il fall…another with compassion will take his place” (not verbatim but remember it). Oh, yeah, Kim fell – he died. As for his son, well….. I do agree with you and the gift of prophecy. I have met a prophet (not in Aus) and he was one of the most humble men I have ever met. His prophecies are always told to an individual, never to large groups because he doesn’t want the glory – it belongs to God. His prophecies are supported by scripture and over time they are shown to be true. He is not in it for the money, the fame, the glory, he just humbly seeks God day in, day out. He is a simple man who lives close to poverty and he is an inspiration to me, as close to Christ-like a man as I have ever met. As someone currently going to a C3 branded church I am deeply concerned about the direction my church is heading. I do not see the humility or biblical knowledge I expect from my leaders and the more I learn of C3 and the “church leaders” Pringle hangs out with the scarier it becomes. Please pray for C3 and the individual churches. There are individuals in there that are seriously questioning the direction of the church and whether they want their families brought up in that environment. But we are also concerned about those members who have been blinded by the teaching they receive. If we leave how can we help these people? If we don’t, are we subtly accepting and condoning the teachings of Pringle & Co? Today, there are still some who think they hold the office of prophets and apostles. But of course the modern ‘prophets’ and their ‘prophecies’ have been redefined by their buddy, John Piper, to allow them to be fallible as they speak and tell your fortune presumptuously. Otherwise they will be stoned to death. 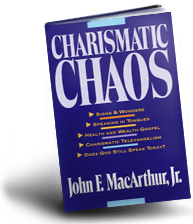 (read debate between J MacArthur and J Piper on GTY blog) . 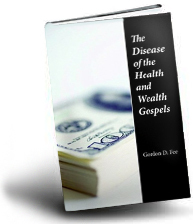 The modern day ‘apostles’ on the other hand have redefined the true gospel that the true 12 apostles preached into a money spinner of the health and wealth. Silver and gold I surely have much to impart to you if you sow your tithes and seed money to me, the good soil, and the silver and gold will be given to you by way of a 10 and 100 folds return and plus healing. If you failed to get them, then it can only mean you did not exercise sufficient faith, did not confess the word enough and did not visualise and energise enough for it to come into being. Funny, it did not work for Yonggi Cho (who is the guru ) and he had to do the illegal to get his money. Don’ t be deceived by them. I think what is happening here is not the ‘re-emergence’ of the Holy Apostles [notice ‘Holy’] but a re-emergence of the Bible’s warning of False apostles [ little ‘a’ and no ‘holy’]. I read somewhere that they called themselves ‘man-recognised’ apostles..how worldly and carnal can you get? They simply cannot call themselves God recognised apostles, too many people would use their Bible to refute them. Yet another blasphemous representation of the Original Apostles of Christ. What really repels me is that pringle can call Wagner ‘a father of the faith’…Anyone who knows anything about Wagner and bentley would have to reconsider what faith they were actually epousing. On the other hand, i am glad pringle has FINALLY revealed his ‘third-wave’ old vineyard heresies, influences and theology- whether C3 people know it or not…like it or not…their Founder pringle has made them a part of the NAR movement, along with toronto blessings and other Christian mockery. Correct me if I’m wrong – but aren’t all these “apostles” only in America? I only hear about them through either being criticised (critically) or on TBN/God TV/etc (no I don’t watch it, a relative does). So, that means if you can crawl (read step on people) your way to the top, get your name in lights because you “add value to people’s ministry” (does that mean scratching the ears? ), then you can be considered an apostle? Then what you says goes? Then as an apostle you could “prophesy” a return of “selling your possessions and laying them at the disciples/apostles feet”? $450 to become an apostle? For that price, I’ll take two!!! Furthermore, because Balaam’s donkey spoke, any chance of getting an animal apostleship? Can you quote for a Maltese cross? Anyway, the “apostleship” is gonna hit saturation point at some stage. And not only that, how many conflicting voices are you gonna have? 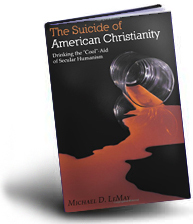 Modern Christianity is getting more like a return to the Wild West with Quack Doctors and the Medicine Shows. Do people really believe this stuff? @Rickie – in terms of the NAR etcetera, yes they do. There are adults today who were brought up as children on NAR doctrine and practice, and now they have Brian Simmons’, corrupt version of the scriptures (which is held in the same high esteem as the JW New World translation and the Book of Mormon, which are sacrosanct to those two obvious cults.) Simmon’s ‘bible’ was given away by the truck load during mid 2012 and people were falling over themselves on the back-of-house tables to get a free sample, or order and pay for upfront, the whole publication. Song leaders, musicians and up and coming preachers are often poached from other churches to fill a spot at this Brisbane NAR church. This leads to a lot of ‘cross polination’ especially when it comes to the monthly combined Youth meetings. These are somewhat reminiscent of the Charismatic move, when people came together based on a purpose, not on truth or the Great Commission. Youth come from many different, smaller and far flung churches, because some ‘rising star’ will be there. Then there’s the “Jesus Culture” music – they have grown with this stuff, much like Tanya Levin grew up on Hillsong music, and they have also been taught to scoff at the ‘dead old churches’ of the rest of Christendom, without one thought as to whether those churches could have some doctrinal truth, between them. Doctrine only matters in the NAR, if it leads to and/or justifies existential experiences and false miracles. “Prophecy”, often brings forth a whole new batch of ‘apostles and prophets’ like ‘cookie cutter’ cakes from the oven (or from the “fire tunnel” – eeek!) They all look the same, sound the same, have a copy of Simmons’ new “bible” (not) tucked under their arms and go off to do their NAR thing – usually in public places. Popular amongst the young NAR adherents is ‘street ministry’ – here in Brisbane they go out in force and invade places like Royal Brisbane Hospital – visiting people, and praying for hospital patients, but they do this behind the backs of medical authorities and security staff. This is one of their methodologies for kick starting ‘revival’. They also invade other public places like the Southbank precinct and King George Square (right outside the Town Hall). At least 25 to 30 young people go on these expeditions, accompanied by half a dozen adults, praying for healing and “evangelising” which includes ‘love bombing’ and indoctrination of sorts. It’s all based on fuzzy feelings and “the emperor’s new clothes” approach – if you didn’t get a healing then you might look a little ‘naked’ in front of their roving video camera. Yes – it all gets livestreamed out onto the internet once or twice a month… all of it. I think old Pringle has a long history of the Dominionist flavour. These people just love to ‘claim’ cities [sound familiar?] without God’s approval of course, and use such phrases as ‘our Sydney’, Love Sydney or ‘our Opera House’ etc. Cruising along nicely with that heresy is the 7 mountains heresy [lance wallnau-another catch-up friend of Pringle recently] . I wonder who will be the self-proclaimed ‘apostate’….er..apostle for Australia? 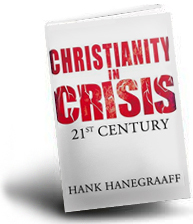 Houston could be the self-proclaimed false apostle as Phil would fall into the [false] ‘prophet’ category, and wagner has already stated somewhere that the ‘apostles’ will be first, then the ‘prophets’ in 2nd place. Beaten into 2nd place again phil. Yes, these ‘dominonists’ will not wait for Jesus Christ to come in the flesh as stated CLEARLY in the Bible, THEY will finish the work Christ apparently couldn’t do on the Cross[!] and Christ will come invisibly in the meantime..[yes, that’s what they think.. No, it isn’t in the Bible]. The amount of delusion slaughtering Bible illiterate Christians is incredibly silly, but somehow convincing them it is real. When the blind lead the blind, both fall into the pit. Actually, the price to become a false, self-imagined ‘apostle’ should be around 30 silver coins. I’ll take the pensioner discount rate of $250 thanks… and does that include the apostolic robe, sandals and decorative scroll? 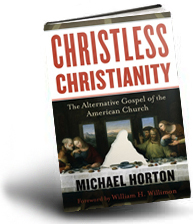 In that short passage of text, you’ll see a history of Pentecostalism from the 1950’s forward to the early 2000’s. 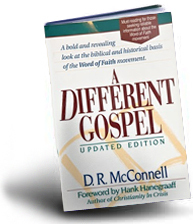 Note the change from a divided denominational setting, to a “united” setting in the post Chrismatic era of the 1980’s and 90’s. Also notice terms such as “doctrinaire” – meaning too much of an emphasis on doctrine, and not enough of the “moving of the spirit” but the question remains – which spirit? And why the shelving of sound doctrine by the movement at that time? This can only mean a false unity based on experience and speculation/guessing as to the will of God. Note the call to “unity based on love” once more – not based on truth. note also the expansionist nature of the “prophecy” – this move will spread out amongst the islands and the nations – yada yada yada – heard it all before and it has not come true yet (from 2 years ago). No supporting scripture, and no biblical discernment – what prophecy??? Typical NAR. One thing that is important to note – C Peter Wagner was a part of the Latter Rain Movement (LRM) back in the 1950’s – the current NAR is a regurgitation and extrapolation of that earlier movement (based on the teachings of William Branham) and Branham is still promoted from the pulpits in NAR churches in this country today. Wagner has a long history of deception in the church and is not to be trusted at all. Wagner has indirectyl influenced Hillsong. Would people be interested in seeing Bobbie Houston spout the NAR seven mountain mandate? @ Austin, yes, they’ll throw in a decorative scroll. Just don’t “eat the scroll”, lol. Strange isn’t it, how God had to wait 500 years for Peter Wagner to emerge and take over the reins of that poor old doddering Reformation church, and using modern church growth techniques, transform it into this wonderful NAR/Emergent mess that we have had thrust upon us today. Austin, Did you enjoy the recent NAR conference in Brisbane? There was an impartation from global apostles and prophets??!! So many prophets in one place at one time…! @andy OH MY THAT WAS WOEFUL!!!! bahahahaha!! OK I shouldn’t laugh but seriously, if you’re going to “sell” or “market” and event, maybe.. errr… change the lilac colour… yes. the lilac. Not the presenter. No………………………….